Relocating your business to a different office or commercial property can be a huge undertaking. First, there are the logistics of the move itself, which must be coordinated flawlessly with your local Massachusetts movers. Second, there may be complications if your business has high value, sensitive or over-sized equipment that must also be moved. You will need to work with moving companies in New Bedford, MA and the surrounding area that are experienced in working with your type of move. Third, you will need to develop a strategy for making a seamless transition between your current location and the one that you are moving to in order to avoid loss of business or excessive downtime. Once you choose the best moving company to handle your business relocation in MA, CT or RI, you can start making plans. Conlon Moving & Storage specializes in commercial moving. We are a moving company, logistics company and also a mobile storage company, which makes us fully equipped to handle just about any type of move you could ever want to make. Whether you are staying right here locally in New Bedford, or if you are moving out of the area, our team can help you to get there on time and in one piece so you can be ready to hit the ground running and get back to work. Many of today’s industries rely heavily on technology for their day-to-day operations. If computers, servers and network infrastructures are an important part of your business, you will likely want to mention the significance of this to your Massachusetts movers. Whether you have an in-house Information Technology (IT) department or not, it is still essential for your moving companies in New Bedford, MA to be able to accommodate all of your unique needs and requirements. One of the most complicated aspects of moving a business in today’s market is making sure that the technology is moved safely and properly, ensuring that nothing gets damaged and that no data gets lost. One way to guarantee this is to be prepared for it ahead of time. Good preparation is key to any successful move or endeavor. Work with your Massachusetts movers to create a schedule for your move that works for you. You will need to consider when your lease ends at your current location and when your lease starts at the new location. 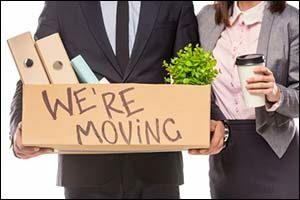 Business relocation in MA, CT and RI doesn’t have to be stressful. If you create a schedule that includes everything that you need to do to make your move a success and follow it accordingly, there’s no reason why you should have to be stressed. Making sure that everything has been accounted for, considered and planned will help you to achieve your goals without tearing your own hair out due to frustration. Another way to make your commercial relocation even easier is to take advantage of the opportunities available through your local mobile storage company. In addition to providing professional commercial moving services, Conlon Moving & Storage is also a provider of portable container storage. Mobile storage allows you to start packing up non-essential items to get them out of your office while you prepare for your move. You can move company file cabinets, excess office supplies, extra furniture and holiday displays or decorations and then start on everything else. You have probably seen container storage near other businesses, hotels, hospitals, commercial plazas and behind retail stores. They are used to store things on a temporary or semi-permanent basis to make more room in the in-store storage for things that are used more frequently. If you have never used a mobile storage company before, know that the way they work is to drop off the portable container storage unit to your place of business. Companies use them to start making moving preparations ahead of time to reduce the amount of things that need to be moved on moving day. Load up your mobile storage unit and call Conlon to have it removed when you are ready. We can store it for you at our secure warehouse until you need it or we can deliver it to your New Bedford business location in advance of your official move – it’s your call. If you are planning a business relocation in MA, CT or RI – even if you are moving out of state or out of the country – contact Conlon Moving & Storage to find out about all the tools, options and services available through our moving and mobile storage company. There are a lot of moving companies in New Bedford, MA to choose from, but the services and opportunities available for moving logistics through Conlon can help you to make a professional move without all of the frustration and stress. Call our team of Massachusetts movers at 508-336-7766 and get a FREE estimate on your move.